The city of Mysore is regarded as the "Cultural Capital of Karnataka". Known for its wonderful palaces and regal buildings, sprawling gardens and tree lined boulevards, shining silks and sandalwood, this 'City Royale' always figures in the tourist's itinerary. It is the hub of culture and heritage of Karnataka and is a mushrooming town in terms of technology and trade. There are a lot of tourist places to see in Mysore. Find out information on various tourist attractions in Mysore. The Mysore Palace was built between 1897 and1912 in Indo-Saracenic style and was designed by an English Architect, Henry Irwin. The palace features beautifully sculpted pillars, ornately carved doors and a golden howdah. A temple is situated within the royal courtyard. 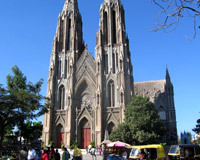 St. Philomena's Church is one of the oldest churches in Mysore and was built in Gothic style. Stained glass windows and lofty towers give this cathedral an impressive look. It is considered as one of the largest churches in India. The Chamundeshwari Temple is situated atop the Chamundi Hill and is an important Hindu place of worship. Nearby the temple, there is a statue of Mahishasura, who was a demon killed by the goddess Chamundeshwari. The Mysore Zoo was set up by the royal family and houses some exotic species of birds and animals. Situated amid lush green surroundings, the zoo has achieved fame for breeding some rare animals in captivity and is a must see in Mysore. This gallery is located in Jagmohan Palace and exhibits paintings by Raja Ravi Varma, Svetsolav Roerich and some rare traditional paintings of Mysore. The Krishna Raja Sagar Dam is situated across the Kaveri River, just a few kilometres away from Mysore. There is an ornamental garden attached to the dam, called Vrindavan Garden, which is famous for its musical fountains. The Railway Museum was setup in 1979 by the Indian Railways and is the second such museum after the National Railway Museum in Delhi. It houses a priceless collection of locomotives and coaches belonging to the early days of the Indian railway. A collection of paintings and photographs narrating the evolution of rail networks in India has also been preserved. The Bandipur National Park is located 80 km off Mysore on the way to Ooty. It is a famous tiger reserve which is spread over an area of 875 km. The park has a variety of animals such as the tiger, barking deer, tusker and bison.